Oh this is so where I want to be for a day straight but work calls. My feet feel like lead and extremely achy. Maybe a pedicure will help? J and I are due for a little daughter and Mom time this weekend so maybe then? That's only three days away. I think I can! Okay so card for Penny's is shabby chic/whimsical. 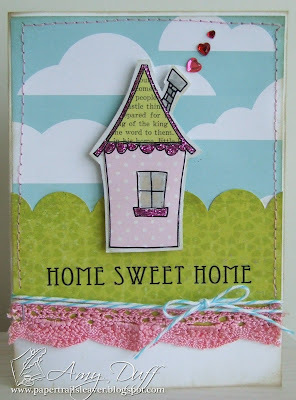 Our theme is "Welcome Home" and I decided to use this sweet little house from Jane's Doodles. I printed it on The Girls' Paperie "Vintage Patchwork" and then glittered it up with some Marcella hot pink glitter. Also, used some Diamond Glaze for the windows. I colored the smokestack in with warm grays from Copic and added Queen & Co rhinestone hearts coming out of the stack. The cute cloud paper is American Crafts. The lace is from Making Memories which I bought quite a bit ago. I stitched the edges and then inked with my PTI vintage touch. . The aqua baker's twine is from Anita Be Stampin. I hope you will join us for the challenge. Amy, I'm still hanging in here reading your blog! Your cards are still MAGNIFICENT! 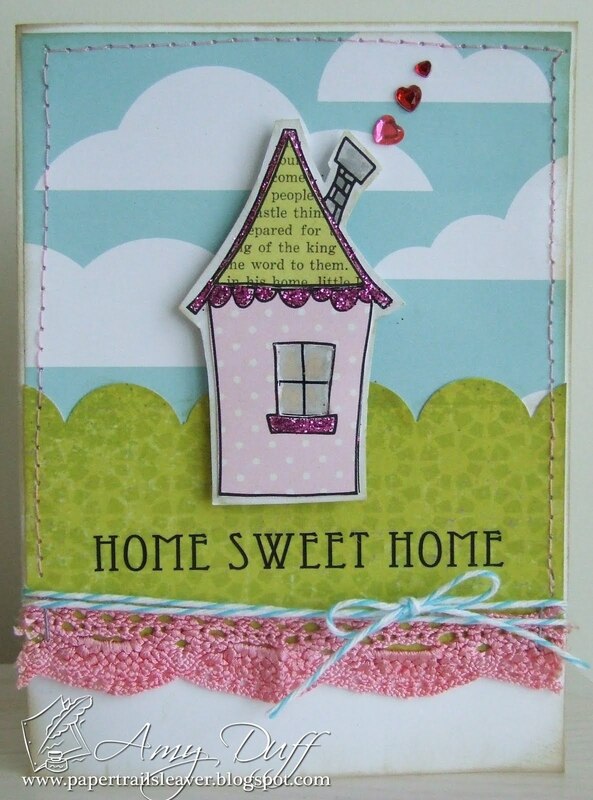 love this theme and your little house.. Hope you had a wonderful Easter holiday.. So cute Amy! Love the pink lace and rhinestone smoke! Very creative! Oh! So sweet...what a gorgeous little house, the the bling bling smoke...very cute. Awww....how adorable is this! Love the house and the heart bling puffing out from the chimney! Amy this is too cute!! I love all the fun details you have used especially the "lovely" smoke! It looks like the place I want to be :) Hope your mom daughter time is extra sweet! The perfect little house on the prairie - it's fabulous Amy. Such a cute and perfect card! Love it! Thanks for joining us at Card Patterns!!! This is so fun Amy! I love the tiny hearts coming out of the chimney. Such a darling card! LOVE it in EVERY way possible! I love this card a lot. This card is cute and gorgeous! Love the idea of using some rhinestones for smoke! Beautiful creation. Just wanted to say a big welcome to you and I look forward to working with you at Aud Sentiments. Saw your sweet card on Make It Monday & had to stop by your blog to say how much I liked it! The layout is just perfect! Now that is a sweet little house! This is such a cute, simple card! I love the bling coming out of the chimney! Thanks for playing with us this week at Amber's Crafts and Stuff. I hope you'll join us again real soon. You were chosen as a finalist in Challenge # 7 at Amber's Crafts and Stuff. Please drop back by and pick up your Finalist Blinkie. Love the clean and sweet look of your cards and the message they always convey directly or indirectly! I try to make CAS cards once in a while but they seem to be more difficult to make that those I usually do. Love your card, just adorable! Hugs and have a happy weekend! Your card was randomly selected as the REDRAWN WINNER for $10(canadian) store credit at Digi's with attitude. Please contact me by May 22nd if you would like this prize. Just relax and win this digi! Yeah I get to be bartender!